“Don't worry about your rudders, just get in the water.” Our guide Tress, from Sea North Tours, was worried we wouldn't have enough time kayaking with Beluga Whales. I'm glad he rushed us because this is an adventure you don't want to miss! 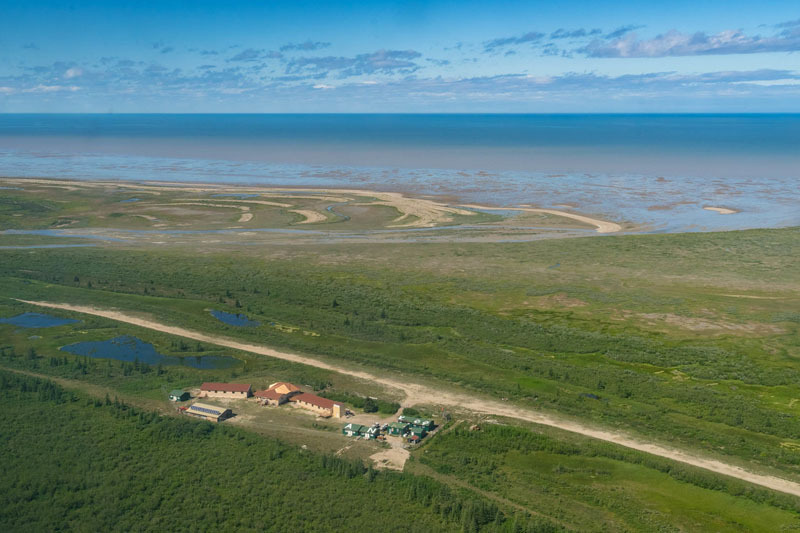 We arrived late to Churchill, Manitoba from our lodge on Hudson Bay due to weather delays. We had a short window before having to catch our flight to Winnipeg, so our group quickly scrambled to get into the water for the adventure of a lifetime. We adjusted our foot pegs, frantically pulled the skirt over our cockpits and instantly paddled out to the bay to see what if we could catch a glimpse of beluga whales swimming in the bay. Flights in Northern Canada are unpredictable. We had just flown in from Nanuk Lodge where we spent the last few days walking with polar bears. We went from one great adventure to another! 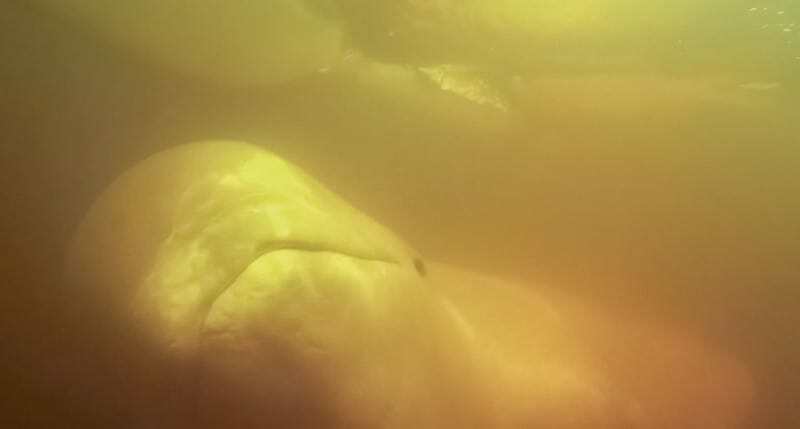 But with weather delays messing up our schedule, we arrived back in Churchill late in the afternoon and just about missed getting the chance to kayak with Beluga whales. Beluga whales migrate by the thousands through the area at this time of year. Just a few short meters off the dock of Churchill puts you right in the middle of their migration and within minutes you're surrounded by playful pods stopping by to say hello. Sea North Tours offers guided kayaking and snorkelling tours with beluga whales. Even if you don't have paddling experience, you can do kayak with beluga whales. They have a guide and lookout on a zodiac standing by at all times to make sure everyone is safe. Our guide Tress was patient and easy going, (he said, “my name is weird, just like I am” ) but you could tell he wanted to get us on the water to have as much time as possible with these magical creatures. We suited up as quickly as possible wondering how cold we'd be in the boats. Should we wear layers? Is the water cold? We were pretty far north, perhaps we'd get a chill sitting in the cool Arctic waters? It turned out to be a stellar day and we were toasty warm in our kayaks. 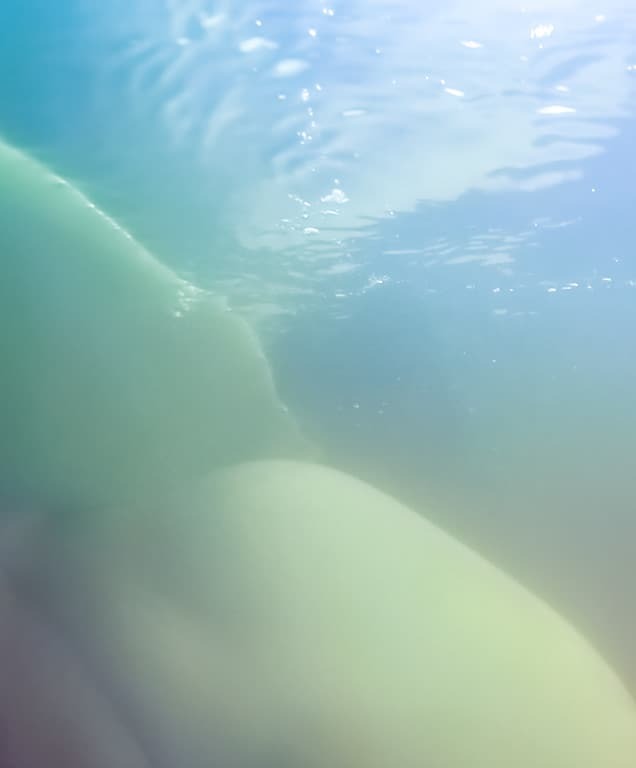 My hands were even comfortable when I dipped my GoPro into the bay for a closer look at the belugas, and the water was calm and smooth as glass. Balmy weather, mixed with sunshine and zero mosquitoes made for the perfect afternoon for a kayak adventure. There is something about wildlife encounters that makes people happy. You cannot paddle through pods of belugas without having a huge grin on their faces. You could hear other paddlers laughing and gasping with delight when a beluga whale surfaced right beside their kayak and we followed suit whenever they were near us too. We have played with sea lions, snorkelled with dolphins and swam with whale sharks, and each time, the feeling is the same. The word that often comes to mind is glee. Watching beluga whales play in the water, bump our boats to scratch their noses and bite at our cameras to say hello was something we'll never forget. 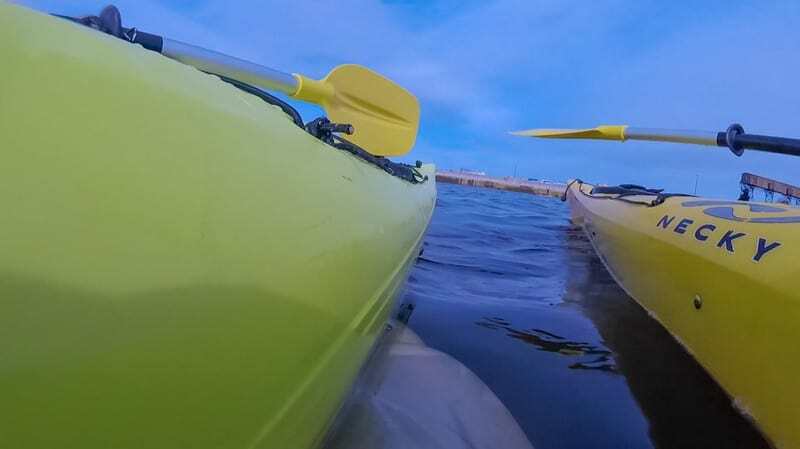 Note: This excursion is perfect for inexperienced kayakers as you don't go far from the shore and there is a zodiac watching your every move should anything happen. Kayaking Hippos and Crocs, Oh My! I am lucky, it seems that whenever we swim or paddle in the ocean marine life is attracted to me. Deb says it's because I'm a Pisces. I'm half fish! I was surrounded by white humps sticking out of the water in every direction. They'd chase me as I paddled backwards and I was surrounded at all times. Deb likes to call me the dolphin whisperer or shark whisperer. Today she was touting me as the Beluga Whale Whisperer. Really, my secret is to sing to them. I always sing the A-Team Theme and it never fails, when marine life hears my voice, they come calling. I don't smack my paddle or thump my boat to grab their attention, it's all about singing. I think whales and dolphins are attracted to sound. I sing at the top of my lungs and the A-Team has never let me down. Another Tip is to paddle fast and leave a wake. The whales loved playing in the small waves created by my paddling. The faster I paddled the more they followed. They'd dip and dive below my boat and sometimes they'd even give a little bump. You never worry about falling in though. 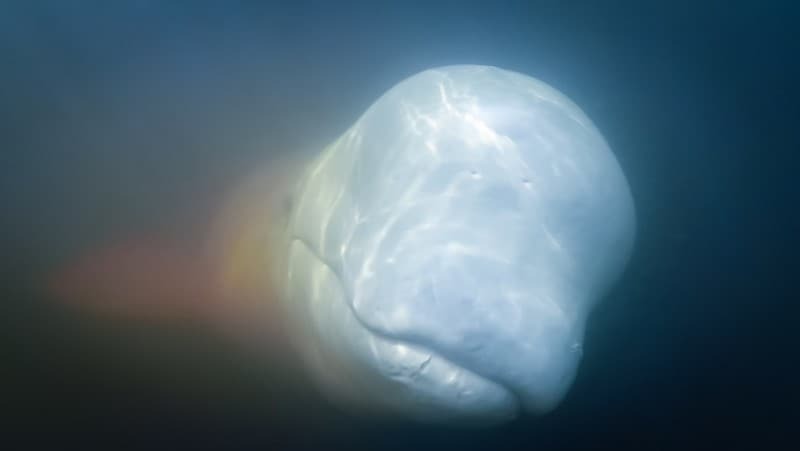 The beluga whales are not bumping to tip you over, it's more like they are rubbing their noses on the boat to feel it, to get closer or to simply let you know they are there. Kayaking with Belugas is one of the most interactive paddling experiences we've ever had. They were not only curious, they were friendly. What made it more fascinating is that these aren't pods of dolphins or sea lions that stay in one place and are used to people coming out to see them, these whales are migrating through the area. They have most likely never seen a human before in their lives. That is what made me stop to think about just how intelligent they are. Why would they care to stop and see kayakers? It felt as if they wanted to communicate. The kayaking tour lasts 2-hours and time flies by. At first, you'll feel a little timid, but as time goes by, you'll feel more comfortable and start to understand their rhythm. When one pod leaves another one fills their space. Taking photos is difficult. We had our GoPro on video and found that it was better to take screenshots of the belugas rather than try to time a photo every five seconds. These guys are fast and they skirted around our cameras a lot. Just when we felt we understood where and when to catch a photo or video of them, our time came to an end. But it's ok.
Having the privilege of seeing them was a dream. We had an amazing time, and it gives us a reason to go back again. 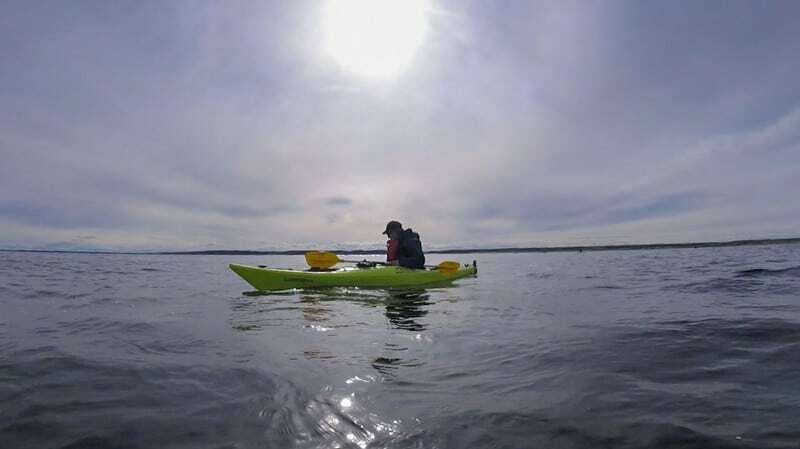 Kayaking with beluga whales in Churchill was courtesy of Sea North Tours. Thanks to Travel Manitoba Tourism for setting it up and to Churchill Wild for inviting us to Manitoba to discover the wildlife of their amazing province. 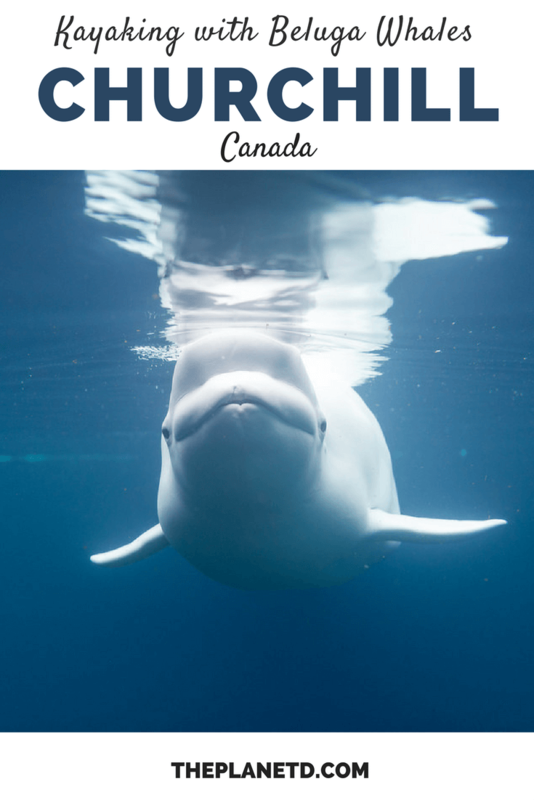 9 Responses to "Kayaking with Beluga Whales – A Paddlers Dream"
Wow, this is awesome experience! I would love to do it someday. Oh I am very envious right now. I just saw Belugas in the Knik River in Alaska, but WOW! Talk about an amazing experience! That just made my bucket list. That’s amazing! I want to see more belugas now. they are so cute. I hear we can see them in Quebec too. So that has to be our next stop! If they are in the St. Lawrence, I have a feeling the water will be clearer too. Agreed. This really is amazing. This seriously might be one of the coolest things you guys have ever done. LOVE IT. Thanks Kristin. I have to agree, this was pretty amazing. It was a last minute addition to our itinerary too. I’m so glad we had the chance to do it. Now I want to snorkel with them.